Two environmental justice leaders who have for years advocated and fought tirelessly for clean air in one of the most polluted regions in Los Angeles County were recognized last week by the South Coast Air Quality Management District. East Yard Communities for Environmental Justice co-founder Angelo Logan and Monsignor John Moretta of Resurrection Church were honored by the local, regional air pollution agency during a luncheon Jan. 5 in Commerce. Logan and Moretta are both members of SCAQMD’s environmental justice advisory group and familiar faces in the fight against the now shuttered Exide Battery Recycling plant in Vernon. Both men are long time voices for disenfranchised east and southeast communities that have suffered more than their fair share of the unhealthful consequences from pollution. Logan co-founded East Yard Communities for Environmental Justice in 2001 in response to the alarming number of people he encountered growing up in the City of Commerce who had asthma. Surrounded by rail yards, freeways and industry, Logan – a mechanic at the time – says knew he had to fight back against industry polluters to ensure he and his neighbors had clean air. Under his leadership, East Yard organized residents to engage in issues that directly affect their health and quality of life. East Yard’s current executive director, Mark Lopez, told EGP that Logan played a pivotal role in the creation of Commerce’s green zones policy that aims to prevent residents’ toxic exposure from with local businesses. Commerce’s green policy also strives to revitalize local economic opportunities and to revitalize the infrastructure along major boulevards to improve quality of life. “What Angelo has done is set the tone for the community,” Lopez explained. The mechanic turned nonprofit leader encouraged attendees to use any power available to them, whether it is people power or political power to keep up the fight for environmental justice. He said that changes coming to Washington D.C. – referring to a new Trump administration – will prove to be a fight for environmental justice. “California is at the forefront of clean air, for the rest of the country and the world … they look to us to advance measures that are going to protect public health,” Logan said. 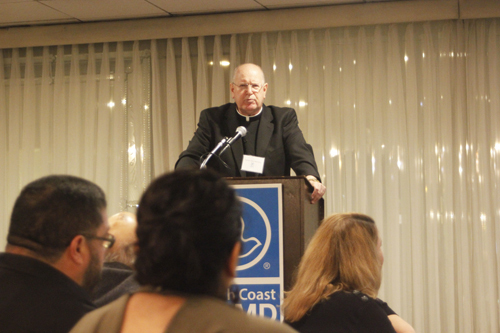 “We must continue to hold each other accountable, ” he said, going on to urge the SCAQMD to be vigilant in overseeing the Tesoro Refinery in Carson. “Make sure they don’t take advantage of the community,” he warned. Zully Juarez is in charge of development and communications at East Yard and says Logan has always looked at the impacts locally and used his power to build up his community. “He put things in perspective and it always comes from a place of heart,” she told EGP. Despite not having the traditional background of many environmental justice leaders in schooling or community organizing experience, Lopez says Logan’s interactions with residents, state agencies and public officials have made a difference, pointing out that those who work with him know he is honest and compassionate. 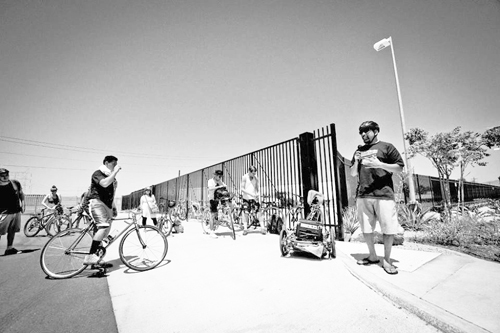 Angelo Logan discussing history of region during East Yard Communities for Environmental Justice’s 2015 LA River Bike Toxic Tour. Photo by East Yard Communities for Environmental Justice. “He’s what some may call an outsider with insider credibility,” Juarez said, adding he’s earned the respect of those around him. “His efforts over the years made it possible for the community who live here to be thought of as the experts and the ones [who can] bring solutions to the issues” that plague us, she added. While no longer at the helm of East Yard, Logan continues to be an advocate for environmental justice. 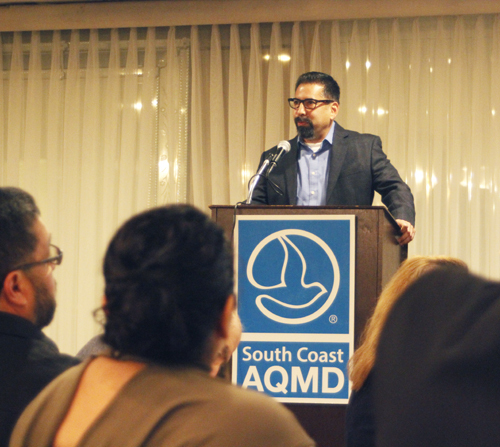 These days his attention and efforts are focused on Long Beach, another city with rail yards, freeways, industry and a port, points out AQMD Governing Board Member Dr. Joseph K. Lyou, who first met Logan about 17 years ago. Lyou recalled how the East Yard co-founder invited him to take a tour of the Commerce rail yards, and how Logan pointed to a lead battery recycling plant and said it was bad for the community and needed to be shut down. “That was the first time I heard of Exide,” said Lyou. Monsignor Moretta has been pastor of Resurrection Church in Boyle Heights for 33 years. When he’s not at church, he is organizing residents and fighting injustices in the area. His efforts make him a “respected, admired leader in Boyle Heights and beyond, ” said Lyou about the activist priest. With the Mothers of East L.A., a group he co-founded, Moretta fought to stop a controversial plan to build a mega-watt power plant in Vernon and before that a prison in East Los Angeles. He was also involved in the successful campaign to keep a hazardous waste incinerator from being built in Boyle Heights, as well as the years-long struggle to shut down Exide. These actions make Moretta the “father of environmental justice,” Lyou said. Lyou pointed out that Moretta has helped agencies like the SCAQMD hear from residents directly, often times hosting public hearings at Resurrection Church. Under Moretta’s direction, the Boyle Heights church has for the last 19 years been home to the Resurrection Neighborhood Watch group. Like other neighborhood watch groups, the members work together to keep the community safe by stopping violent and property crimes. But the Resurrection group also has another purpose, one they take very seriously: protecting the community’s mostly Latinos residents from being victimized by environmental injustices. 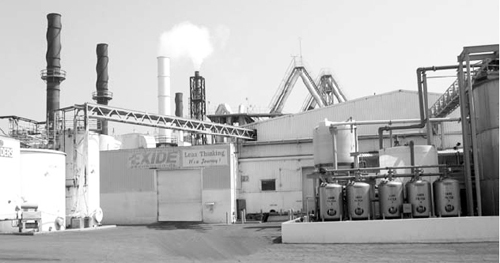 Residents and parishioners that make up the group have been regulars at Exide-related hearings where they have repeatedly voiced their anger and concern over the handling of the toxic site, and any issue that could impact the community’s health or safety. Moretta admits that not all the fights they’ve waged have resulted in a win for the community, noting the community lost the battle for a less intrusive Metro rail project on the eastside. Unlike in Hollywood, the community was stuck with an above ground light rail system that divided their community, he recalled. “The fact is, there is still injustice for the ‘poor guy,’” Moretta told EGP. “The ‘poor guy’ is not familiar with the system that takes advantage of the disadvantaged,” he lamented. Moretta credited and thanked local residents for the role they played in bringing justice to an often-ignored community. “I would not be able to be here without the people in this room,” Moretta said while accepting his award. Moretta deserves recognition for fighting tirelessly to protect the community, said Boyle Heights resident Terri Cano, who like Moretta had testified before state legislators to condemn the handling and enforcement by state regulators of the Exide contamination debacle. “Most priests will work out of their church but Father John [Moretta] has gone all the way to Sacramento for his parishioners,” she pointed out in admiration. Terry Marquez has known Moretta for decades, starting as a member of the Mothers of East L.A. She says he has always been someone the community can trust. Moretta says he will be keeping an eye on Exide as well as the metal-plating companies that call Boyle Heights home. In the past, these companies have been accused of improperly disposing of hazardous materials and contaminating their surroundings with metal dust. For this latest effort, Moretta says he hopes to inspire and recruit a new generation of activists and leaders from the eastside community. “The next generation has to continue la lucha,” he said.